Sensory-specific satiety (SSS) refers to a decrease in sensory pleasure derived from a specific food or drink with its consumption relative to the consumer's liking for the unconsumed foods and drinks. This satiety does not require any post-ingestive feedback, and yet it is an important factor in determining meal intake. SSS has not been found to be any weaker in obese people, but it might be the case that typically obese individuals rapidly recover from SSS. This hypothesis was examined in the present study, comparing 39 normal-weight women (mean ± SD body mass index (BMI) = 22.4 ± 2.2) and 45 obese women (BMI = 38.3 ± 4.8). Participants drank several servings of a test drink to induce SSS. Relative liking of the drink was determined before, directly after and 20 minutes after the repeated consumption of the test drink by means of subjective ratings for the pleasure of the taste, smell and mouth-feel of a test drink and a control drink. Relative liking for the test drink decreased in the normal-weight and obese women (indicative of SSS), but no suggestion of any recovery from SSS after the 20-minute interval was found for either group. There is no evidence to suggest that SSS and its recovery rate differs to any relevant degree between obese and normal-weight people. Sensory-specific satiety (SSS) refers to the decrease in pleasure derived from the sensory characteristics of a food or drink that has been consumed compared with unconsumed foods or drinks [1, 2]. It is generally thought to have a double function, namely, to constrain meal intake and to promote a varied diet . Interestingly, SSS does not seem to depend on any post-ingestive feedback. Indeed, merely chewing a food , smelling a drink  or imagining eating a food  for about as long it would normally take actually to consume the food or drink suffices to produce a strong sense of satiation for that particular food. Considering that SSS plays an important role in eating behavior (that is, food intake and food choice) it could be assumed that individual differences in eating behavior are associated with such differences in the propensity for SSS. Because weight gain and obesity can be ascribed to a positive energy balance due to caloric overconsumption [7, 8], it would be expected that obese people are less likely to experience SSS. Indeed, in a series of three experiments, Hetherington and Rolls  found that anorexic and non-dieting normal-weight control participants clearly demonstrated SSS, whereas bulimic and overweight participants did not. Further, obese people tend to show less rapid salivary habituation to palatable food cues than do normal-weight people . These studies therefore suggest that obese people do indeed tend to be less inclined to develop strong SSS. More recently, several researchers have directly assessed whether obesity is associated with differential SSS. Snoek et al. compared normal-weight women and obese women in two experiments. In both experiments, subjects were asked to first sample and rate the pleasantness of four different foods (sandwiches in the first experiment and various snacks in the second experiment), and then one of the foods was presented for ad libitum consumption. Directly after the ad libitum consumption, the subjects rated the four foods again. In both experiments, clear SSS was found, with the consumed food liked less than the uneaten foods. However, the SSS was not moderated by weight status. In a similar study, Brondel et al. had 144 participants evaluate the pleasantness of six different foods. Next, the participants had the opportunity for ad libitum consumption of their preferred food, after which they evaluated all six foods again. Again, the pleasantness ratings of the eaten food decreased relative to the uneaten foods. Notably, this relative decrease in pleasantness ratings (that is, SSS) did not correlate with the participants' body mass index (BMI). As the sample included both lean and overweight participants, this finding also suggests that weight status does not moderate SSS. Based on the above studies, it seems there is no reason to suggest that the degree of SSS differs between obese and normal-weight people; however, it is still possible that the dynamics of SSS differ between overweight/obese and lean people. For example, it is conceivable that obese people recover much more rapidly from SSS than do normal-weight people. Hetherington, Rolls and Burley  examined the time course of SSS for a snack of cheese on crackers in 31 normal-weight women. The researchers evaluated pleasantness ratings for cheese on crackers relative to ratings of control food at 2, 20, 40 and 60 minutes after consuming an ad libitum amount of this food. SSS was still evident after 60 minutes, but it was strongest 2 minutes after finishing the meal (the cheese on crackers), and ratings of taste and texture steadily recovered thereafter. Weenen, Stafleu and de Graaf  found that post-prandial it may take many hours to recover from SSS. This slow recovery from SSS might be typical for normal-weight women, but it is not at all clear whether obese people show comparable slow recovery patterns. It might be hypothesized that obese people have a much more rapid recovery. Such rapid recovery from SSS would promote overeating, particularly within an environment that offers relatively little food variety. For example, suppose a person works in a typical office building that has a vending machine for sweet snacks on every department floor. The person may be tempted to get a snack from the machine in the morning, but as the result of concomitant development of SSS for sweet taste, s/he is not inclined to return to that vending machine until after lunch, or even not at all for the remainder of that day. However, it is conceivable that some people do find themselves wanting another chocolate bar (or whatever snack) within a short period after finishing the previous one. These people would thus tend to overeat and as a result be more susceptible to weight gain. In the present study, we tested this hypothesis by comparing the degree of SSS for a test drink directly after repeated consumption of that drink (t0) and after a 20 minute interval (t20) between normal-weight women and obese women. Figure 1 depicts the mean change in subjective ratings (relative to baseline ratings) for the test drink and the control drink at t0 and t20 for the obese and normal-weight participants separately. A multivariate analysis of variance (MANOVA) revealed a significant main effect for drink type (F(4,78) = 4.57, P = 0.002, η2partial = 0.19), indicative of SSS (see also Figure 1). Furthermore, a three-way interaction was found between drink type, assessment time and the volume consumed of the test drink (that is, the covariate) (F(4,78) = 3.18, P = 0.02, η2partial = 0.14). No other effects were found (smallest P value = 0.23). 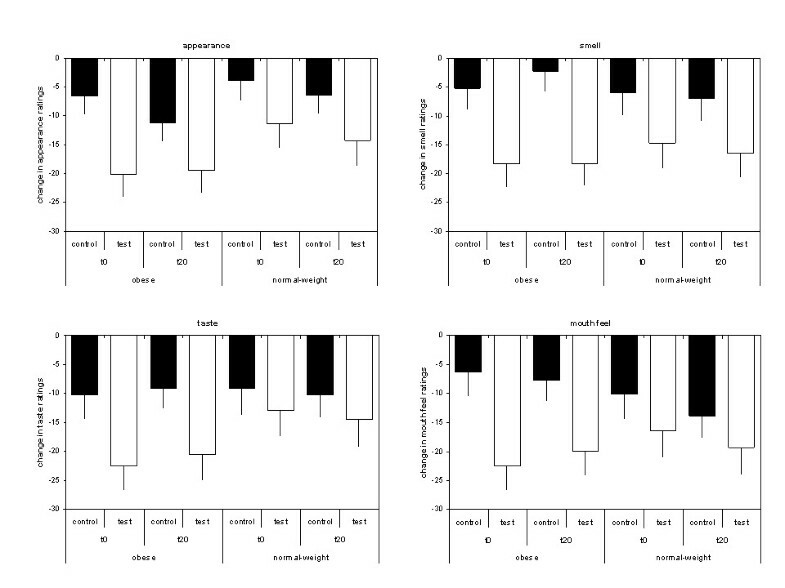 Mean change in subjective ratings of the test drink (open bars) and the control drink (black bars) relative to baseline (± SEM) for t 0 and t 20 for each group (obese women versus normal-weight women). The upper left panel represents appearance ratings, and the upper right panel refers to the smell ratings. The lower left panel refers to the taste evaluations, and the lower right panel represents the mouth-feel evaluations. Note that a negative change in ratings represents decreased pleasantness of a given sensory characteristic of a drink. The above three-way interaction suggests that the volume consumed of the test drink affects the degree of SSS for that drink, but to a different degree depending on the time of the assessment of SSS: directly after repeated consumption of the test drink or 20 minutes after the test drink. Therefore, we repeated the MANOVA separately for each assessment of SSS (t0 or t20). The analysis for t0 revealed a significant main effect for drink type only (F(4,78) = 4.64, P = 0.002, η2partial = 0.19). The analysis for t20 also only showed a significant main effect for drink type (F(4,78) = 4.06, P = 0.005, η2partial = 0.17). In further univariate analyses, this effect was significant for each pleasantness rating (that is, appearance, smell, taste and mouth-feel) separately, with smallest P-value being 0.04, which was for the taste ratings. In the current study, it was hypothesized that obese people, unlike normal-weight controls, would show rapid recovery from SSS. For all the indices of sensory pleasure used, we found clear SSS, but no group differences, which is in agreement with previous studies [11, 12]. Similarly, we found no group differences concerning recovery from SSS; that is, we found no indication for recovery from SSS 20 minutes after the signaled exposure procedure. This examination of the stability of SSS was a novel aspect of the present study. The finding that, at least for a period of 20 minutes, SSS is stable regardless of weight status implies that weight gain due to overconsumption cannot be ascribed to individual differences in the experience of satiation. It is more likely that some people develop or inherit an obesogenic eating style, such as hurried consumption by taking bigger bites or larger sips, as seemed to be the case for the obese participants in the present study. With such a hasty consumption pattern, a person can eat or drink more before they experience satiation or SSS [15, 16]. Indeed, in concurrence with such reasoning, it has been found that eating rate is associated with body weight, with rapid eating predicting obesity [17–19]. Conversely, eating slowly has been found to diminish intake and increase satiation . It is further possible that obese people are more easily distracted or have the habit of eating in an environment rich in sensory distractions (for example,, radio, television, computer), promoting mindless eating. Weijzen and colleagues  did not find an effect on SSS when instructing participants of normal healthy weight to focus attention on the sensory experience of eating a snack; however, this does not exclude the possibility that such an instruction might have an effect on obese people. It can therefore be speculated that training a person to eat in a slower and more mindful manner is perhaps beneficial in the context of a weight-loss intervention. The present study has some limitations. Firstly, given the absence of any clear evidence for recovery from SSS at 20 minutes, there still is the possibility that obese and normal-weight women might have differed with respect to SSS had we assessed recovery at a later time point (for example, 2 hours later). Unfortunately, restricted laboratory access at the time of testing did not allow for such extensive testing. Secondly, we only tested women, and thus it is unclear whether the present pattern of results also applies to men. Thirdly, we used only sweet drinks in the current study, and it is possible that a different pattern of results might have been found if we had used savory flavors instead or provided savory flavors next to the sweet flavors, or added (semi-)solid foods. This second limitation precluded us from assessing potential group differences in generalized SSS, such as the generalization of SSS to drinks and foods with a comparable sweet taste. Indeed, even the finding that the degree of acute SSS and its stability does not differ by weight status is correct, it might still be possible that obese people show less overall generalization of acquired SSS, which would effectively mean that SSS is more flavor-specific in obese people. This would then imply that obese people are more susceptible to what has been termed the 'variety effect' , the phenomenon that a varied meal promotes eating. Very subtle variations in food texture and aroma might be enough to encourage meal consumption in some people, thus promoting overconsumption and consequent weight gain. Whether this is the case or not requires further research. The present study shows in women that repeated signaled exposure to and consumption of a specific drink induces strong SSS for this drink, which seems stable for at least 20 minutes. Moreover, weight status (that is, normal-weight versus obesity) was not associated with SSS at t0 and t20. The present study findings thus add to the impression that individual differences in sensitivity to satiation do not contribute greatly to weight gain. The study was approved by the local ethics committee. Participants received both verbal and written information concerning the procedure of the experiment, and signed a consent form agreeing to participate. In total, 90 female participants were recruited via advertisements in a Dutch women's magazine (Margriet) and local newspapers. These women were part of a larger pool of participants who agreed to take part in a series of unrelated experiments at the Faculty of Psychology and Neuroscience of Maastricht University, one of which concerns the present study. Based on self-reported BMI (kg/m2), 49 participants were assigned to the obese group (BMI >30) and the remaining 41 participants served as normal-weight controls (BMI 17 to 26). All took part on a voluntary basis, but each participant was provided with a personalized fee to cover travel expenses. Participant characteristics are displayed in Table 1. Participant characteristics for each separate group. a82 Degrees of freedom = 82.
bBMI refers to body mass index (kg/m2). All participants received the same standard lunch (various sandwiches) at Maastricht University at around noon. We ensured that participants did not eat anything for at least 1 hour beforehand. Participants were tested in groups (n = 7 to 11) in a quiet research laboratory. On arrival at the laboratory, the participants were requested to take a seat at any one of 12 tables. The tables were positioned against the walls and divided by screens to create separate compartments to prevent participants from communicating directly with each other during the course of the experiment. After providing informed consent, participants rated their hunger and thirst on separate 100-mm line scales ranging from 0 (not at all hungry/thirsty) to 100 (extremely hungry/thirsty). They were then served two 100 ml cups: one containing a diet fruit syrup suitable for diabetics (Roosvicee Dieet; Heinz BV, Zeist, the Netherlands); diluted one part syrup to four parts water; 17 kcal/100 ml) and the other one containing a carbonated ice tea drink (Lipton Light; Van den Bergh BV, Nijmegen, the Netherlands; 12 kcal/100 ml). The participants were instructed to taste and evaluate the pleasantness of both drinks on four different 100-mm line scales ranging from 0 (not at all pleasant) to 100 (extremely pleasant). Specifically, participants were asked to indicate on these scales their momentarily perceived pleasantness of the taste, smell, appearance and mouth-feel of the drinks. After this baseline taste test, participants received 500 ml of one of the two drinks, that is, they received two 250 ml cups both containing either the syrup or ice tea (determined randomly for each participant). During a period of 15 minutes, the experimenter would instruct the participants every 60 seconds to take a cup, look at the drink for 10 seconds, sniff it for 10 seconds, then take a sip and swirl it to experience its mouth-feel for 10 seconds, and finally, swallow it. We have used this signaled exposure procedure before, and it generally produces strong SSS [23, 24]. However, in the present study, we performed the procedure slightly differently in that we did not serve a fixed aliquot. Therefore, we measured participants' consumption of the target drink by weighing the drink before and after the signaled exposure procedure on a scale (Toledo Precision Balance; Mettler, Tiel, the Netherlands) accurate to the nearest centigram. Directly after this signaled exposure procedure, the participants again received the two drinks to taste and evaluate for a second time (t0) in the same way as they had done at baseline. After the second taste test, participants received a booklet containing 20 different full-color pictures of contemporary art paintings and were instructed to carefully examine each picture of a painting (arts task). They received a scoring sheet and were asked to grade each work of art (0 = disliked very much to 10 = liked very much). This task had a duration of 20 minutes, and served as a filler task. After completing the arts task, the participants were asked to taste and evaluate the syrup drink and the ice tea for a third and final time (t20). Directly after the experiment, the participants were weighed and their height measured to determine their actual BMI. Data from two participants in the normal-weight control group were excluded from the analyses because their actual BMI measured directly after their participation in the experiment was greater than 26, and data from four participants in the obese group were excluded from further analyses because their actual BMI was less than 30. To determine SSS, separate difference scores were calculated for all pleasantness ratings for the test drink and the control drink, directly (t0) and 20 minutes (t20) after the consumption of the test drink relative to the baseline ratings. These difference scores corrected for individual differences in the evaluation of the drinks at baseline and allowed direct assessment of recovery from SSS at t20. The difference scores for pleasantness ratings of appearance, smell, taste and mouth-feel served as the dependent variables in a 2 × 2 × 2 split plot MANOVA with drink (two drinks: control versus test) and assessment (two assessments: t0 versus t20) as within-subject variables, and group (two groups: obese versus normal weight) as the between-subjects variable. Examining the total consumption of the test drink for each group, it appeared that the obese participants took larger sips of the test drink (mean ± SD 184 ± 80 ml) than did the normal-weight controls (154 ± 85 ml) (t with 82 degrees of freedom = 1.66, P = 0.10). As SSS may depend on the volume consumed , we added total consumption of the test drink as a centered covariate in the analysis described above. Subjectively experienced hunger and thirst was measured in all subjects to control for potential group differences in these ratings, but no such differences were found (Table 1). We thank L. Hermans for her aid in testing the participants. RCH and AJ conceived of and designed the study. RCH conducted the study with the aid of AR and CN. AR and CN helped with performing the analyses. RCH drafted the manuscript and prepared the final manuscript. All remaining contributing authors provided comments to the first draft and read and approved the final manuscript.